Such is the power of great food and wine that you might find yourself one day talking on the phone with a friend and a some guy you’ve never seen before walks up to you at the end of the conversation to say that the restaurant you had just been talking about as your evening’s ultimate dining destination is one of his favorite anywhere in the world. That’s exactly what happened to me one day while riding the train from Milan to Rome, when the jolly Norwegian vacationer sitting in the row behind me obviously felt the sybarite within him needed to share his thoughts about Villa Maiella, a one Michelin star eatery that is Abruzzo’s best country restaurant and one of the finest in all of Italy. Proprietor Giuseppe (better known as Peppino) Tinari and his wife, Angela, have created a spot well known to jet-setting gourmets and locals alike; spending time at one of the large tables in the bright, spacious dining room or the beautiful, refined terrace is one of the places I most like to dine in Italy. Founded in 1962 by Peppino’s parents, Arcangelo and Ginetta, Villa Maiella has done nothing but improve over the years. The new generation, represented by brothers Arcangelo and Pascal, promisees even better things to come. The family has certainly had impressive teachers: Peppino trained with Arrigo Cipriani of Venice’s Harry’s Bar, while Angela learned from Ginetta, and, impressively, mastered the art of dessert cooking all on her own. Brothers Arcangelo and Pascal were sent early on to learn the trade in two ultra-famous French three Michelin star establishments. Arcangelo, a chef, apprenticed for years under Michel Bras, while Pascal, a sommelier, studied under a French Pascale, Auberge de l’Ill’s Pascale Leonetti. It can hardly surprise that Villa Maiella has risen to the top of Italy’s countryside dining establishments. 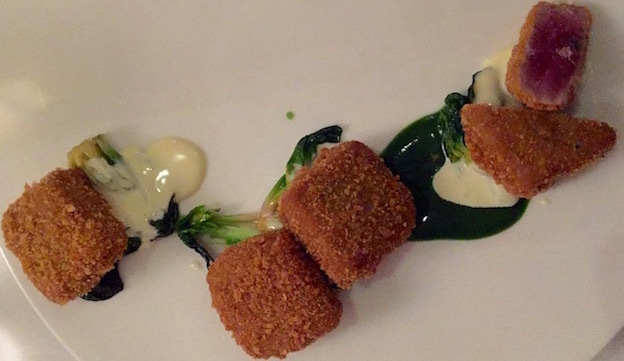 Despite its culinary pedigree, bells and whistles aren’t what Villa Maiella is about. If your idea of a good dinner is frolicking amongst waves of colored squiggles or oceans of foams, labyrinthine weird shapes or exotic ingredients, look elsewhere. On this night, I stick to some Tinari classics, but in fact all the menu harkens back to the tried and true, traditional dishes of the region, perhaps lightened or gently revisited to keep up with changing modern tastes and lifestyles. The family raises its own farm animals, and I signal the pigs, a local breed of very flavorful black hogs that yield salumi to die for (or, more reasonably, that are worth the drive to Villa Maiella all by themselves). 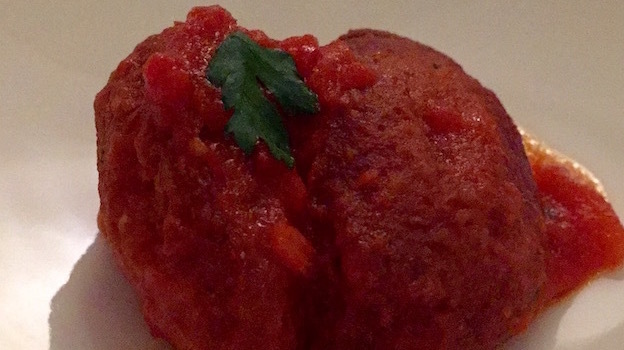 The pallotta cac’e ove is a classic of Abruzzo cuisine, a preparation of grated pecorino cheese bathed in an egg batter (the chickens and eggs also come from the Tinari farm) and then delicately fried with garlic and onions, prior to being smothered in an intense tomato sauce that is addictive. 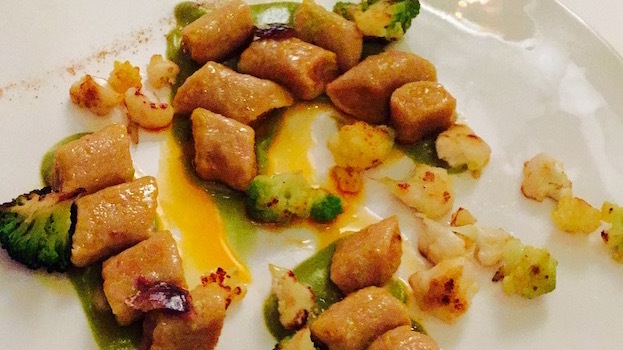 Both the gnocchi and the crispy lamb are standout dishes. Given the choice of eating only one of these two dishes, I’d admit to having a hard time in choosing between the two. Last but not least, the desserts are worthy of a calorie concession or two. The pumpkin ice cream is refreshing but sultry in texture, and the Aelion nougat is a knockout. The Tinaris' attention to detail and the use of quality ingredients is well exemplified by the nougat. A heavenly sweet mixture of almonds, candied orange, vanilla and sugar, it is a creation of the Emo Lullo, one of Italy’s best bakeries, founded all the way back in 1889 (Aelion is the ancient name of Guardiagrele, the small Abruzzo town where the bakery is located). The wine list at Villa Maiella will leave everyone smiling. Great bottles abound and prices are low by the standards of most Paris, London or NY dining establishments of a similar quality level. There are verticals of Abruzzo’s - and some of Italy’s - very best wines (Valentini’s Trebbiano and Montepulciano d’Abruzzo, Emidio Pepe’s Montepulciano D’Abruzzo, Tiberio’s Trebbiano d’Abruzzo Fonte Canale), as well as many Barolo and Brunello to choose from, while great Burgundies and distinguished Germans top the list of foreign labels. 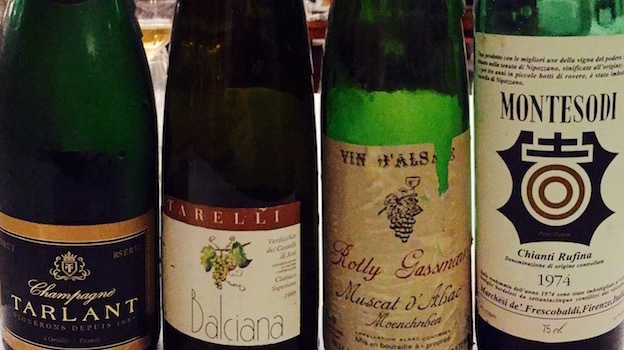 A smattering of older vintages only adds to the pleasure of perusing the wine list. On this night, while deciding what to eat and drink, I am generously offered a flute of the NV Tarlant Brut. Easygoing and uncomplicated, it’s currently a very fashionable sparkler in Italy. The 1998 Sartarelli Verdicchio dei Castelli di Jesi Classico Superiore Balciana is still, at almost 20 years old, drinking beautifully, with honeyed lime and waxy nuances to the ripe citrus and stone fruit notes complicated by hints of marmelady botrytis. Balciana is one of Italy’s 20 best white wines, and this bottle only reinforces that notion. Next up is the absolutely knockout 1991 Rolly Gassman Muscat d’Alsace Moenchreben, a memorable Moscato Bianco that carries its 27 years gracefully. Rich and tactile, but managing the neat trick of being fresh and light on its feet too, this is quite simply one of the best older Alsatian Muscats I have had recently. It is also not especially sweet, by contrast to the estate’s younger wines which can carry even hefty doses of residual sugar. Last but not least, the 1974 Frescobaldi Castello di Nipozzano Chianti Rufinà Montesodi, the first vintage ever of Montesodi, is still drinking beautifully, though I have encountered a little bottle variation over the years. Rather large-scaled for a Rufinà, this specific bottle shows relatively high acidity but graceful tannins, giving it a fresh, lively mouthfeel. However, it is a little shorter on fruit than other recent ’74 Montesodi bottles I have tried. Overall though, the wine seems to be still young and should easily last in a good cellar for another decade or so. I walked out into the cold night air happy and feeling light, two of the most important keys to any successful night out eating and drinking on the town.